- What candle do you suggest in order to get rid of spells that are done by a third party who may be influencing his thought to not like a individual? Or if he was trying to protect himself from love spells being done, what will help to have him loosen his guards? I am afraid if I uncross him from spells being done by other- I do not want 'my' spells to get uncrossed. So I was wondering if there is another way type of candle that can be burnt.. There is a lot of information missing from your post. What do your candles look like from Lucky Mojo? When candles are lit at MISC, they come with a report that tells you how the candles burnt. Are your candles clear, foggy, or black? What information have you been given about them? After that, how close were/are you to this target? Is he an acquaintance? A former lover, or spouse? Are you currently with this target? Is there a restraining order involved anywhere? Finally, how do you know he is "protecting" himself from love spells? Where are you getting this information? Does he practice some form of spiritual work? Is he highly religious? Have you gotten a reading stating the rival is working on him? A Break-up Spell will do the trick if they are romantically together. If she is just a bad influence, I would work with a Cast Off Evil, or Uncrossing. To make him more bending to your will, you can work with Essence of Bend Over or Commanding. Another great controlling love candle is Follow Me Boy. Need a few more details though. can anyone advise on how to use a uncrossing candle can I write my name on the candle. Are you talking about a dressed Uncrossing vigil candle? You can prepare a petition paper to set underneath it. Or if you're unfamiliar with setting lights, you could have the candle set for you by the Missionary Independent Spiritual Church, or an AIRR worker. Yes I was talking about a dressed candle I usually write my name on some candles to help myself I am new at this and have only started do work like this 4 months now. Hello, my question here is what combination of novena candles do you think would be best to uncross jinxed conditions, open blocks, all while keeping you protected from further jinxes, and while also possibly reversing things back to evil doer/s? All my life I've felt like if my life has been filled with a curse/s. I know it's not good to think this way, as being positive brings good vibes but far too much stuff has happened to make me think otherwise. Now I'm very aware that there's only so much things that can be done via hoodoo as you will also have to put in your part to make positive changes/happenings in your life happen. However, I really need this spiritual help. So I was wondering what would be a great combo to cover all aspects and keep them from happening again? Road opener, Fiery Wall of Protection, Attraction, two Uncrossing candles. I should also add that in the past I have ordered some Uncrossing candles that burned clean, but apparently things came back crossed again so any thoughts? I ordered a few more so I'll see how those burn, but yeah I need help. I also ordered a reading with Dr. Kioni but with my luck I haven't been able to talk to him as I work when he does his readings but I will try to go to work in late one day so I can finally get to talk to him as I know I need a reading as well as I'm in dire need of help. Thanks a bunch guys and gals, and sorry if this was a long post. Re: What would be best for keeping things uncrossed? I have deleted the specific details you posted of your five recent MISC candle reports, for space-saving reasons, but more so because it is really not a great idea to let your whole life hang out in the open on a forum like this. I am familiar with your case, and do not wish to do a secondary reading upon a reading, so to speak. Please understand that a spiritual practitioner should be consulted in a private and personal way. The candles indicate that although the situation in your spiritual realm clears up for a while, eventually the difficulties come back. This is the spiritual equivalent to a chronic illness that flares up and then goes into remission, then flares up again. People do have spiritual conditions that do this -- you are not the only one. A curse is one reason this may happen. It is not the only reason. Some people require reguar work with Uncrossing candles. With candles reports like those, and your long, long history of feeling cursed and/or crossed, i would suggest that you should work with a professional root doctor for a true, deep, and meaningful cleansing and healing experience. You may need magical coaching and guidance, and the curse(s) of the past may need to be addressed in a more pro-active way than by setting lights. Thank you Catherine, and sorry for getting too personal with the details as well, you are correct. Where I live I don't know of any places where I may find a good root worker/doctor. I know some have been known to just want to take your money but I will try and do my research. You can work with a spiritual practitioner long distance. This is quite common actually, and goes back many years, and is not a new internet-driven phenomenon. I would suggest that you select a rootworker from AIRR, as all of them have ethical standards and conduct themselves in an upright manner. You are posting from the Los Angeles region. There are at least three good AIRR rootworkers in Southern California -- ConjureMan Ali in L.A./Orange County, Deacon Millett in the High Desert area, and Dr. E. in Long Beach. All three of them post at this forum, so they should be familiar to you, and ConjureMan Ali is probably very well known to you through his many posts here. ConjureMan Ali is probably the closest one to me, thank you Catherine! You know what helps me is that I take a cleansing bath every Sunday since it is the day for new beginnings and such. You never know how much bad energy and such can attach it's self to you. Then I use a protection oil to anoint myself with afterwards. Can I light a saint michael candle today for protection and I have a fixed LM ucrossing vigil light that Im not sure which day is best to start? Tiesdays are for protection, thursdays to overcome obstacles and sundays to uncross is that how the days work? Should I wait for sunday or can I light my saint michael canle and uncrossing candle today? Also quick question... I have saint michael LM oil. Is that enoughg or which herbs work with saint michael? Saint Michael's day is Tuesday so you would be good for that today. You can do Sunday, Wednesday, Saturday for the uncrossing in general. But lets say I wanted to uncross my money. I could do it on the days I would do work for money so that would be Sunday, Thursday, and/or Friday. So you can do uncrossing work along with the intentions you are uncrossing it for. Another example if I wanted to uncross my love life. I could do the uncrossing candle...Monday, Wednesday, and/or Friday. Personally I feel like you can do uncrossing work at any day when it is extremely important and you cannot wait. I would not wait to do uncrossing work especially if I did something heavy that has been put on you or you are just feeling negative. So you can definitely do both works today. Yes Saint Michael oil is enough. I have an uncrossing vigil going for my bf and one for myself. Last night got home and his was out. No draft. The candle itself had a low flame since the second day, and only the middle portion is burning the outside layer near glass is not. I relit it and prayed and read psalm 37 with it. It stayed on so far but flame is very low again. I also have a saint michael vigil candle going for us as well. Funny thing is my uncrossing candle had been going very low as well.I read psalms 37 and 51 again over it the other day and worked my honey jar I have for us that night my flame got nice and high and been high and strong since. I was thinking of incorporating road opener or van van or both with our uncrossing vigils but while reading and researching about it here I read that sometimes when you light a road opener it removes those things you want to keep. Family, friends, pets etc. So now im nervous about that.I dont want my bf removed. If I word the petition and intention strictly to remove the magic that a certain person and her rootworker has done on us will that be effective without removing the people or things I want to keep in my life? I read that sometimes when you light a road opener it removes those things you want to keep. Family, friends, pets etc. So now im nervous about that. Now that MAY be the case, but if it were then whatsoever was removed was becoming an obstacle in your life for you to achieve your "new way". The Road Opener will not randomly remove loved ones, pets, or friends, but may "act" in a way that was wholly unexpected! If you are "nervous" about lighting a Road Opener, as you stated above, then please don't! This will only murk up the work you need done. I would wait until after the AIRR reading to add anything and see what your worker specifically tells you will help/work. She or he will know your specifics and can properly guide you where you need to be. Road Opener remove obstacles/blockage and road blocks that stand in your way and open the road for things which are good. So IF those friends family and pets are considered bad obstacles in your life then yes, BUT most importantly keep in mind that your intent and your petition as well as in your prayer is what clarifies what you want removed. When you use Road Opener pray and petition for those things which you want removed and the things which have been road blocks in your life. Read more about the Road Opener products athttp://www.luckymojo.com/roadopener.html . I think once you read this link you will have better understanding of what the product actually can do. Road Opener is a great product! I have used in on more than one occasion and it works every time. Um....I am not sure where you read this. I have never read a road opener removing something that I actually want to keep. This seems to go back to the backfiring idea. A road opener is not going to all of a sudden start removing random things from your life that you want to keep. It removes OBSTACLES as Best of life stated, and how it is stated on the info page. AND you need to state in your petition exactly what you want removed so you can say something like "remove blockages and obstacles that prevent good luck from coming into my life." I agree that you should wait until the AIRR reading because perhaps something will come up in the reading that needs to be further addressed. I would perhaps try some uncrossing bath crystals for you and your boyfriend as well. IF you have not cleansed in a while, or done any uncrossing work it may take multiple methods or multiple tries to break down what is crossing you. Then I would put in some thing to work towards your goal. So if you want overall good luck then do a spell kit or methods for that, or if you need money then do some money drawing work. I was told to catch a deceitful person and their deceitful actions to use a uncrossing candle and put their name on it, burn it, and write out a petition and place it beside it. If you want to cleanse the deceitful person of any crossed conditions that they have on them, you can use an Uncrossing candle. However, if you want to expose a thief or deceitful person using a vigil light, I'd probably use Clarity or Compelling, to make them tell the truth and have others see the person for who they really are. Uncrossing causing arguments and fights? Every time I do uncrossing work something bad happens. A couple of months ago I did uncrossing work on myself and me and my boyfriend had a huge fight, biggest on we've ever had. This time I did a back and red uncrossing candle on my relationship with my boyfriend just to clean up any past issues and this time it was pretty bad my boyfriend and I went from begin so happy together and over past problem to fighting every time we see each other. On the day I did the uncrossing I had a fist fight with my best friend and now we arent speaking. Black and red uncrossing candles? There is no such thing. That sounds like a Reversing vigilcandle or a Double Action candle. Those aren't used to uncross someone. The Reversing vigil is to send evil back to someone, and the Double Action candle can be butted (the wick end cut off, flip the candle over and cut out a new wick at the bottom) and burned to send back trouble that someone has sent to you. It's possible that your cleansing work stirred up old issues, but in your case I'd get a reading from a qualified rootworker and explain to him/her the exact steps you took in your work, and they can perhaps give you some magical coaching. You need to get some Tranquility and/or Healing bath crystals and oils for yourself. Possibly Cast Off Evil too. Arguments and physical fights do not solve anything. Adults disagree, but talk things out calmly, and walk away if this is not possible. Re: Uncrossing causing arguments and fights? Mary Bee is right -- the candle you lit is in no way or shape a Lucky Mojo brand Uncrossing Candle. You did not buy a red-and-black Uncrossing candle from us, or, if you trued to use a red-and-black Reversing Candle by dressing it with Uncrossing Oil from us, you were doing the wrong thing. Black and Red Reversing vigil candles are to take a jinx off of you and then to hit back at the enemy with exactly the same mess they put on you. This is a Reversing Candle label. Note that this vigil candle is ALWAYS made with the black wax on top and the red on the bottom. The black burns off first, to remove the curse, then the red burns, to restore your love. This candle is not to be dressed with Uncrossing Oil. It is to be dressed with Reversing oil -- which is both enemy-destroying and blessing-enhancing. Double Action Red and Black candles are also used to send back evil spells. Note that this candle is ALWAYS to be burned upside down, not the way it was made. Do not burn the red side first and then the black. The black goes first, to remove the curse, then the red, to restore the love. Again, this candle is not to be dressed with Uncrossing Oil. It is to be dressed with Reversing Oil. In addition, i am quite concerned that you are emotionally sabotaging your own work. In this thread, on Uncrossing candles -- for taking off jinxes, and curses -- you state that you burn black-and-red candles -- and then argue with your boyfriend and get into physical fights with your girlfriend. you stated that you burn Follow Me Boy candles and then "argue" with your boyfriend. Follow Me Boy candles are for a seductive love so strong that it overwhelms a man and causes him to follow you anywhere -- they do not reduce argumentation, nor do they add to argumentation. 1) Unless you have been cursed to act out-of-control against your will -- made prone to temperamental outbursts and physical violence -- the type of behaviour you describe as arguing and a fist fights is usually a social and mental issue, systemic in your life, and not a by-product of the kinds of candles you are burning. If you learn to control your emotions and your actions, you will have more mastery at hoodoo, because as a spiritual practitioner, you will have succeeded in taking the first step toward actual effectiveness -- aligning your social actions with your emotional desires, and harnessing the power of spiritual forces to achieve your goals. If you want to get uncrossed, you should use a real Uncrossing candle, not a Reversing candle. If you want to mend an argument with your lover, you should use a Reconciliation candle, not a Follow Me Boy candle. Thank you Miss Cat and everyOne fOr your advice. Ok, so I'm in the 2nd day of my uncrossing ritual (I've have been crossed up for at least 13+ years) and one of my votive candle holders explodes in my absence, burning through my only altar cloth & charring my altar. Incidentally, it was one of the white 'protection' altar candles not surrounded by salt. How am I supposed to interpret this? Is the uncrossing salvageable? I am not familiar with Hoodoo omens. Simply put, I cannot afford to start over & I've put everything into this uncrossing being my final hope. The LM uncrossing candle is fine & still burning strong however, so I am apt to think this is a good sign? My uncrossing candle burned clean I'm glad to say. I bought an extra one just in case. I have loved reading all of the information pages, but I'm not quite clear what a clean burn/wax remnants means. I also used the uncrossing oil, cut with rum, as I serve the ancestors and work with the lwa. I've experienced hissing/popping candles before, and I figured the alcohol might help open communication if I REALLY need the candle to succeed. I don't drip much or do it often because I don't want to cause a busted candle. I was also burning a healing candle at the same time. The healing candle glass was clear and the candle burned all the way down, save for about 2 inches of wax on the side. I'm thinking this means the crossed illness is mostly taken care of, but needs a bit more work. Our Uncrossing candles come already dressed, no need to add more oil. Also, oil cannot be "cut" with rum, insofar as to "cut" one liquid with another means to dilute it, like cutting our oils with cooking oil to stretch them out, or cutting Hoyt's Cologne with water to make it go farther. 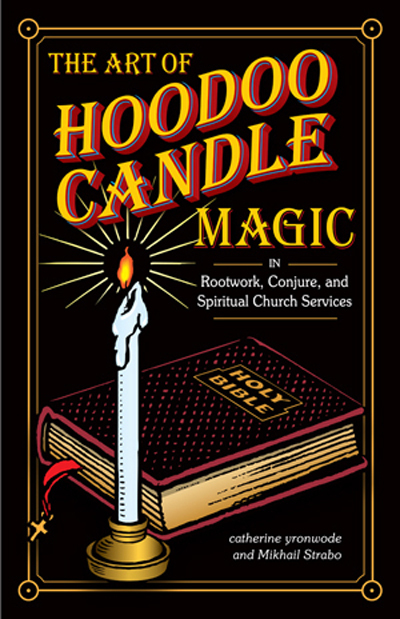 And, finally, if you want to learn more about candle work in general and wax divination as a part of the entirety of candle magic, you could purchase my book, The Art of Hoodoo Candle Magic." Thanks so much for the reply, Catherine. I do not make a habit of diluting my oils, but in my religious belief, the lwa and ancestors value rum, and it is a highly prized sacrement. In vodou, Baron Samedi and the Ghede work to aid Uncrossing in particular, which is usually why the candles are purple. The alcohol I added to the oil will cause the wick to hiss or pop, and it is my way of letting the ancestors know I really need things to work out. I am getting the funds together to place an order very soon, and I look forward to reading your book. I think it is Time for me to Uncross any messes that may have ever been thrown at me.. I need to get the Uncrossing bath and candle already fixed. If I am over 40 and perhaps somewhere along the way 20 yrs ago or 2 yrs ago this should lift and dispose correct? If this were me, I'd do: Uncrossing, protection, reversing. After getting a reading from my AIRR worker I was advised on doing an uncroosing candle to counteract my Intranquil Spirit vigil I had set, as it wasn't what was needed and then to do some reconciliation work. I have decided to have the following vandals lit in runs at MISC: Uncrossing, Reconciliation, and then Return To Me. Does this sound good or should I set two Uncrossing candles. It's only been three days since the IS has been set so I haven't received a burn report yet. So I've been posting under different topics somewhat related questions because I know how people complain that you do not post in the right section, so if anything sorry, but that was my thinking. i have a very simple question i did not see covered anywhere. what should i do with uncrossing glass vigil candles when i am done with them? i don't feel good about throwing glass into running water like i would for other items related to uncrossing work. is it ok to wrap it up and throw the uncrossing glass in the trash? it had a very actively fluttery flame but burned clean all the way down, leaving some blackened glitter in the center of the bottom, which i take as a good sign. Miss cat has this posted all over the forum: recycle the glass. thank you for your reply, miss aida. unfortunately, we do not have recycling where i live. a travesty, i know. would it be acceptable to place it in someone else's recycling bin? I'm sorry that I wasn't clear on that. Sometimes, I don't explain myself clearly and I sincerely apologize. Just clean out the holder and use it again when you want to add wax or place a candle inside for prayer. So I just lit a Reversing candle. I was curious to know if it would be wise to also light an Uncrossing candle as well or is it not necessary? And if I should light one for Uncrossing, does the sequence matter at all since I lit the Reversing one first? These two candles, Reversing and Uncrossing, have different functions. Uncrossing takes off anything done to you, whether or not you know how it was put on you, who did it, or why. 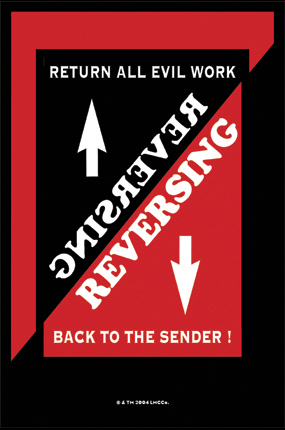 Reversing sends back evil for evil and directs it to the evil-doer who sent it to you. You may light one or both, and the order is not particularly important -- but what is important is that the petition or prayer be appropriately worded for each. I would most definitely have another uncrossing lit first. 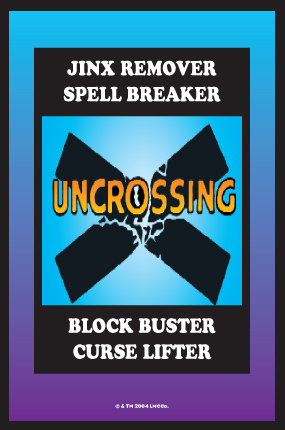 Remember: the uncrossing had obstacles. Black soot on a candle from top to bottom is not a good sign and usually shows the target is resisting. However, Your blockbuster burning clear is an excellent sign. Perhaps if you get a clear burn all the way through on your blockbuster candle you can try the uncrossing again and see what effect you get. If you burn the uncrossing again and it turns black once again I would try some confusion work to break down your enemies barriers. Good luck LP!! Last night, around this time I lit an uncrossing candle, and its burning quickly. More quickly than any other vigil candle I've lit. It's burned about 1/3. The flame is high & 'jumpy', and I *think* I see occasional small black smoke coming from the flame. Within seconds of lighting the candle there was a popping sound, it wasn't particularly loud, but it did make me jump. Are these good or bad signs? Thanks Miss Aida. I've read that web page many times. It's always possible for an enemy to keep working against you. Have you had a reading since you did the Uncrossing work? I think it would be a good idea to check in and see how that work went. I ordered an uncrossing candle to be set for me on the altar for 7 days. This is the first time I'm doing this and I'm somewhat afraid of the outcome or what may happen in the process. I do know exactly what it's purpose is. The only reason why I'm doing it is because my mom and dad were crossed up before I was even born. I've had several readings over the years telling me it trickled down to me and affected my love life finances, getting certain opportunities etc. I asked for my love life and finances to be uncrossed forever. I just wanted to uncross myself. It may take a "run" but I'll see what this one does first. Are there any turbulences that may happen when uncrossing yourself in my case? Should I be worrying about anything because I'm scared of what may happen. I will be performing an uncrossing for myself and my girlfriend once our materials arrive. I understand that I can inscribe both of our names on the candles to be used in the ritual. My question is regarding my name. I am a transgender man. The individual who placed the hex/curse on us did it prior to me transitioning. As far as I know, that person believes I have moved out of the city/state, so she is not aware of my transition. During that time, I still presented as a masculine female and was addressed by my birth name. Now, I am legally recognized and addressed as the man I am today. Which name should I inscribe on our candle, the name representing the identity years ago when the curse was placed, my current name or both? Welcome to the Lucky Mojo forum If you would like to, you're welcome to introduce yourself under the introductions thread. I would say to inscribe the candle with the name that you are currently officially, legally known, which is your new name. Good luck to you in your work.